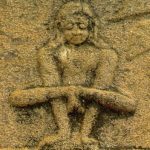 Some yoga poses are new, and some are thousands of years old. By this measurement, Mayurasana is on the young side. 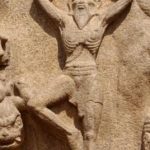 We find a description of Mayurasana in the 500-year-old Hatha Yoga Pradipika, yet we have depictions of other yoga poses that go back 5000 years. Similarly, some poses are easy and some poses are hard. Mayurasana is not the hardest pose in yoga, but it is definitely difficult! As you can see from the images here, its shape is unusual and—arguably—unnatural. Figure 1. A circa 1820 wall painting from the Maha Mandir in Jodhpur, India. The old texts that describe how to do Mayurasana (and other poses) are trustingly simple their descriptions, yet they often make BIG promises as to a pose’s benefits. The descriptions of Mayuranasa are no different. They offer one of the most interesting promises found in the historical record. Hold the Earth with both hands. Place the sides of the navel on the elbows. Rise high above the ground like a stick. This is Mayurasana. The Sri [holy] Mayurasana overcomes defects and quickly destroys all diseases—enlargement of the spleen, enlargement of the abdomen, and so on. It stimulates the stomach’s fire, incinerates all bad food, and makes the deadly Kalakuta poison digestible. Figure 2. 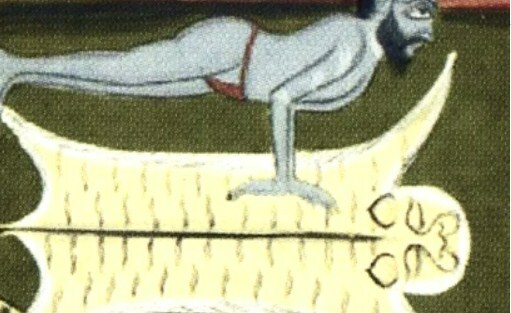 An early 19th Century rendering of Mayurasana from the Joga Pradipika. Kalakuta is a funny word. It references an important myth about the destroyer god, Shiva. 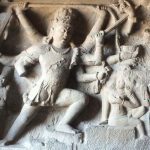 Most early hatha yoga practitioners probably worshipped Shiva as their personal deity, or ishta devata (though, one particular form of Shiva—like the fierce Bhairava or the lordly Adinatha—was probably their focus)—so it’s not strange to find an indirect reference to Shiva in the HYP description. “Kalakuta” comes from a myth at least as old as the Mahabharata (most lately dated to the early 4th century, CE) where there’s a story about immortals churning an ocean of milk at the beginning of time. The medical science of Ayurveda is produced by this churning, but an awful poison is, too. Its gases start to choke the demons and gods and, at their behest, Shiva heroically swallows it. It turns his throat blue (hence his name, “Blue Throat,” Nilakantha). The poison is called, Kalakuta. Figure 3. B.K.S. 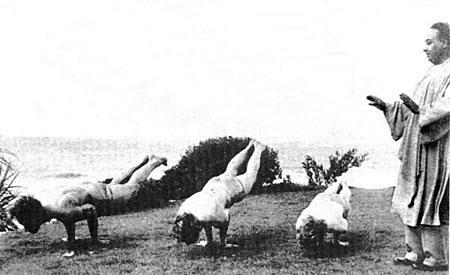 Iyengar often demonstrated the pose as an assist to others. Here he does it on the famous Vanda Scaravelli’s back! At the transcendent level, the HYP is telling us we’ll be so fortified by our work in yoga that even life’s poisonous experiences won’t disgust us or make us afraid. Our psychic digestion will be so god-like that we’ll integrate all life-events easily into our view of ourselves and our world. Life’s events won’t give us any stomach-upset—or any upset at all. Hatha yoga promises unshakeable equanimity. Figure 4. Paramahansa Yogananda learned Hatha Yoga as a young man and taught it to his American followers. Here, he leads his students in Peacock Pose. 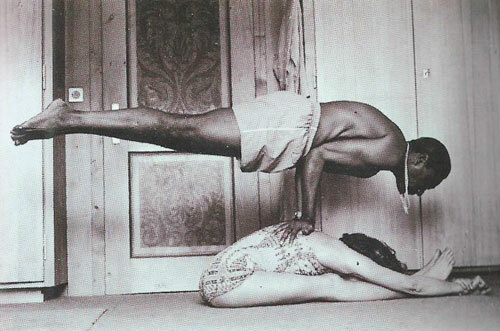 There’s a story told of the great teacher, Krishnamacharya (guru of Iyengar and K. Pattabhi Jois) that also involves Mayurasana. As legend would have it, during the years 1918 to 1925, he studied with a terribly long-lived teacher (230 years old). He had the terribly long name of Yogeshwara Sri Ramamohana Brahmachari Guru Maharaja of Mukta Narayan Ksetra and he was hard on Krishnamacharya—who was in his 30s at the time. Reportedly, Brhamachari forced him to eat heaps of ghee (clarified butter), then put weights on his legs and had him do Mayurasana outside their Himalayan cave in the thin air—and on the rocky ground coated in snow. An old Hindi proverb tells us, Amrit paane se pahle vish peena padta hai, “Before one can get Amrit, one must drink poison. “Amrit” is the nectar of immorality and, in mundane terms, Amrit is a symbol of success. This saying tells us, much must be endured before achievement comes. In this story, we see Krishnamacharya drinking his poison before his great success came in later life. Figure 5. 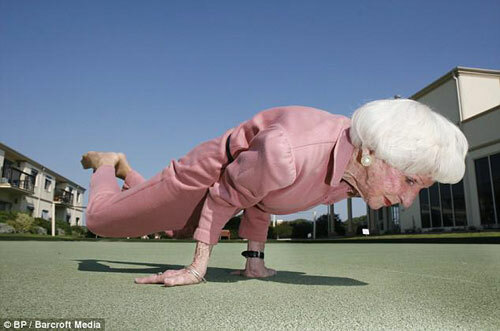 Bette Calman, the stunning Australian Yoga teacher born in 1927, executes Mayurasana in this 2010 photo (at the age of 83). This is obviously an advanced pose. It requires fortuitous body proportions, low back muscles, and courage. There are two ways to get it done. One is much easier than the other. The two ways are differed by elbow placement. That said, it is the difficult form of the pose which gives benefit to our digestion. If your ribcage is narrow or your legs are much longer than your torso, the challenge of Mayurasana will be much greater. Practitioners usually make the mistake of thinking that you must lift the legs, but if you focus on this, the pose often fails. To warm up, do some Locust Pose (Shalabhasana) to tone the low back and practice engaging the hamstrings. Do some Chaturanga to prep the triceps and some Crow (Bakkasana) to fortify your courage around falling forward. Warm up the wrists by turning their backs away from you and pressing your fingers on the ground as you lean the shoulders back to open the heel side of the hand—then practice your plank with the fingers pointed backwards, too. If you know Uddiyana breathing, this is a good prep for making the abs firm like a wall, so the elbows can push into them and lift the body—if you do the hard form of the pose. With the wrists turned backwards and the upper arm bones under the body, lean forward over your bent arms. 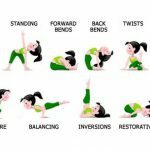 As you lean, the toes will drag forward on the ground, THEN engage the low back muscles and hams GENTLY, lifting the legs very lightly (not dramatically) off the floor. Do not be afraid of a face-plant. The breath may be constrained and shallow; nonetheless, hold for five breaths (or a five-count). Then watch your poison intake.